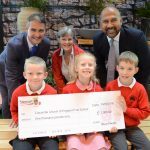 Three cheers for the pupils and staff at Cutcombe Church of England First school who have scooped one of the UK’s top gardening prizes with their collective keen skill. They are pictured holding a cheque for £1000, courtesy of Stewart Garden Centres who stage the awards every year. The Cutcombe team sowed and grew a colourful display of vegetables, conducted science experiments and explored the process of photosynthesis to find out how to nurture great plants. Their efforts went on display at this year’s Flower and Produce Show at Cutcombe Fete and were auctioned off afterwards to raise money for local charities. What won the judges over was the childrens’ enthusiasm for gardening and their community spirit. Good on everyone involved, say I!